This quick and easy recipe for Celery Root and Leek Soup is velvety smooth and tasty. Leeks are in the same family as garlic, onions, shallots, and scallions and look like a giant scallion. The root portion is white with the middle a light green then very dark green up to the top. This is a tightly layered vegetable, cut it in half widthwise and it looks like tree rings. These rings hide the sandy dirt in which leeks are grown and a thorough soak and rinse, or two, are necessary. I didn’t use the dark green tops, which tend to turn a pale soup green. The cooked leek has a subtle flavor and aroma. 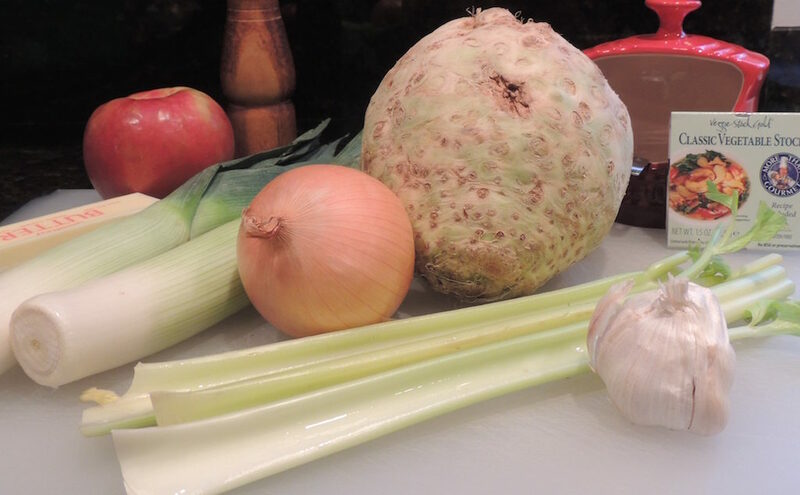 The flavor of the leek pairs well with the earthy celery root and for a little contrast a chopped up Honeycrisp apple adds nice balance to the soup. Some heavy cream finishes the soup. Save a few celery leaves for a garnish. Melt the butter over medium heat in a covered 7-quart Dutch oven or large saucepan. Once the butter foams, stir in the leeks, onion, celery, apple, garlic, salt and pepper. Reduce the heat to low, cover, and sweat for 5 minutes, stirring once. Lower the heat if the vegetables are browning. Add in the celery root and water or stock and bring to a boil. 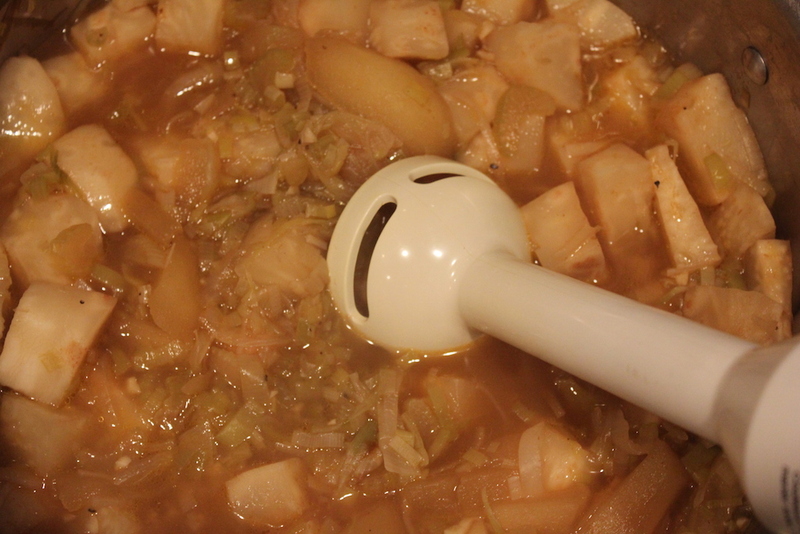 Lower the heat to a gentle boil, cover and continue cooking, stirring occasionally. The soup is done when the vegetables are easily crushed against the side of the pan with a wooden spoon, about 30 minutes. The timing on this will vary depending on the size of the vegetables. Puree the soup in a blender, food processor, or with an immersion blender. Please proceed carefully; the soup is hot. Don’t fill processor or blender to capacity; the soup will overflow from the motion of the blade. See our post on how to blend hot ingredients safely. Stir in the cream and adjust seasonings. Soup freezes well. 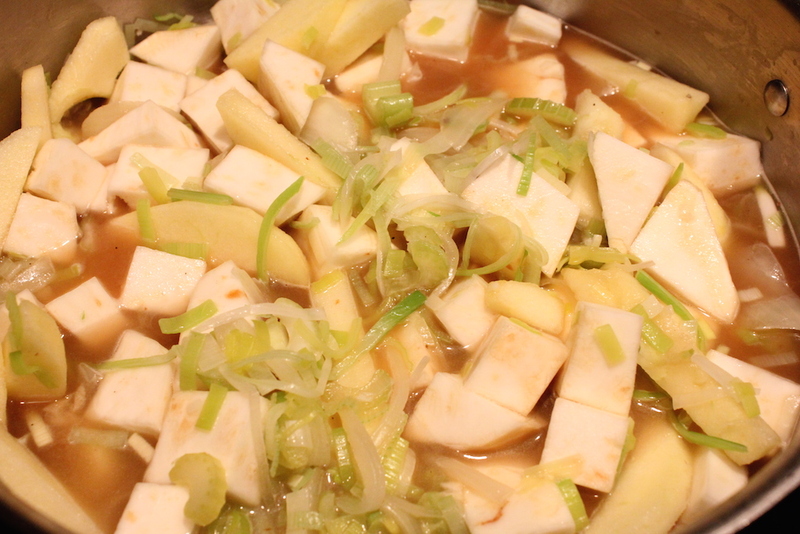 The celery root and leeks are sweet and the apple provides a little tartness. Apples and celery go well together, think Waldorf salad. A final dollop of cream rounds out the soup nicely. Melt the butter over medium heat in a covered 7-quart Dutch oven or large saucepan. 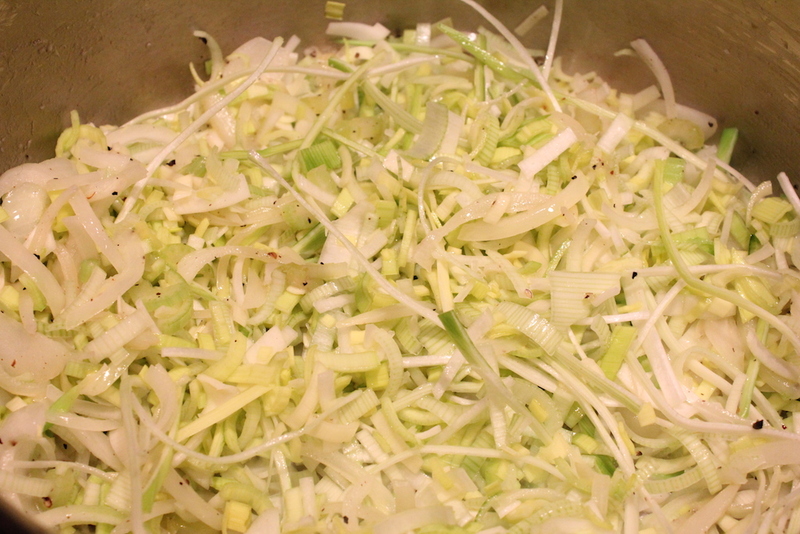 Once the butter foams, stir in the leeks, onion, celery, apple, garlic, salt and pepper. Reduce the heat to low, cover, and sweat for ten minutes, stirring once. 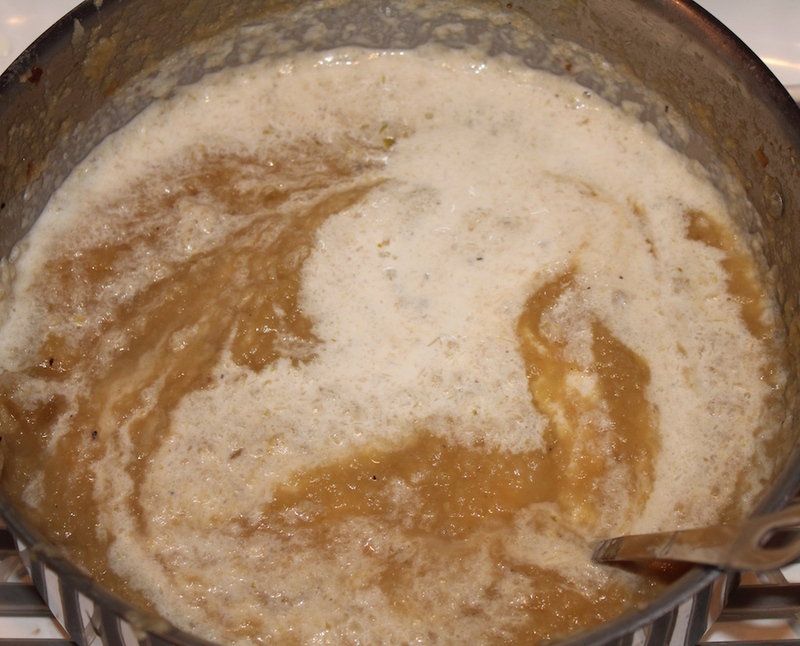 Add in the celery root and water or stock, bring to a boil, reduce to a gentle boil, cover and continue cooking, stirring occasionally until vegetables are easily crushed against the side of the pan with a wooden spoon, a least 30 minutes. The timing on this will vary depending on the size of the vegetables. 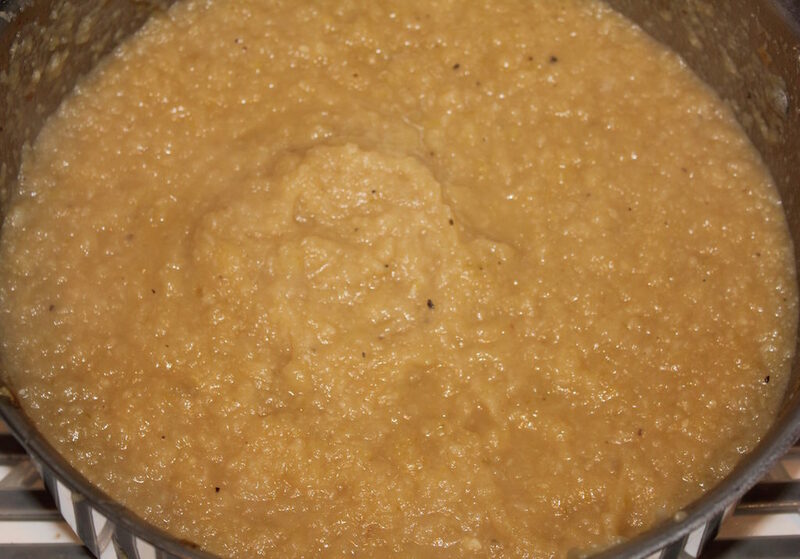 Puree the soup in a blender, food processor, or with an immersion blender. Please proceed carefully; the soup is hot. Don’t fill processor or blender to capacity; the soup will overflow from the motion of the blade. Return soup to the pot. Stir in the cream and adjust seasonings.